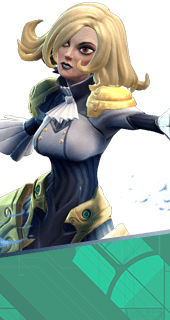 Blade Cascade is an Ability of Phoebe in Battleborn. Phoebe's kunai poisons enemies on impact, dealing 50-68 damage over 2 seconds. Enemies struck by Blade Cascade suffer increased damage from all sources for a short time. +16% Damage Amplification. Increases Blade Cascade's area of effect. Moving through the area grants a temporary boost in movement speed. +30% Increased Move Speed.